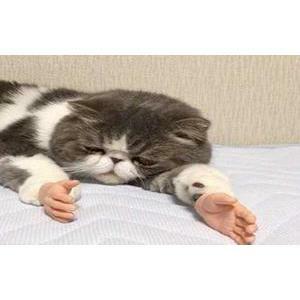 A cat that appears to have human hands has captured the hearts of Twitter users to become the latest feline online sensation. 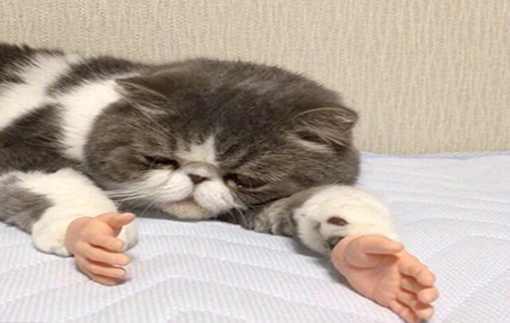 The white and grey cat is carefully positioned so that it looks like the feline has miniature prosthetic human hands instead of paws. A series of images of the cat were shared online yesterday and within hours they had attracted the attention of hundreds of thousands of users. Emma’s post has been re-tweeted more than 113,000 times,liked by over 160,000 and attracted thousands of comments. Some viewers expressed admiration for the cat,describing it as’cute’,while others were confused by the image. Emma,who posted the pictures,said she finds the cat’cute’. I love kitties.Everyone else thinks they’re creepy though,’she told BuzzFeed.